The revelations by former British army intelligence officer Ian Hurst paint a disturbing picture of a section of Irish society operating in the pay of the British Crown until recent times. Hurst is a disaffected former member of the Force Research Unit (FRU), an independent unit of British military intelligence in the North which operated Britain’s most valuable informers during the conflict. He told the Smithwick Tribunal on Garda collusion last week that the FRU operated bases in Donegal and Sligo and across the island of Ireland. Edited transcripts of his statements, made behind closed doors, have now been released. 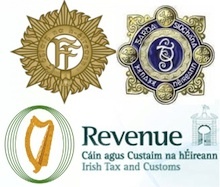 Members of the Senate, the Revenue, the Army and the Garda were all intelligence sources, he revealed. He gave one example of an unnamed member of the Garda police from Donegal who regularly travelled to Ballymena to provide information and was paid about 60 euro a time. British intelligence agents had tapped his phone when he was living in Carrick-on-Suir, County Tipperary, in 2000, and he was subsequently shown transcripts of his calls when detained by British police in Liverpool when on a visit to Britain. Hurst’s testimony was heard in an empty courtroom last week after the tribunal ordered the court to be cleared. The transcripts of his statements were partially censored by the Tribunal in order to protect British security interests. While media reports of Hurst’s testimony focussed on familiar allegations of Martin McGuinness’s involvement in the IRA, no newspaper or broadcaster has raised concerns over his revelations of the penetration of British military into the highest echelons of Irish society. Also at the Smithwick Tribunal, it emerged that a key intelligence report which might have implicated a member of the gardai in Dundalk in leaking information to the IRA has been so heavily censored that it is of little use. What is known as ‘the 1985 intelligence report’ is the only British document ever uncovered which names an individual member of An Garda Siochana as being possibly involved in passing information to the IRA. It named former Detective Owen Corrigan of Dundalk station as the Garda involved, and the report was described as the key basis for the setting up of the Tribunal. Corrigan has been accused of providing information to the IRA which allowed it to carry out an ambush of two senior RUC policemen in south Armagh in 1989, Chief Superintendent Harry Breen and Superintendent Robert Buchanan. Michael Durack, counsel for the Gardai, said the version of the 1985 report presented to the tribunal was so heavily “redacted” it was not possible to tell if the RUC had believed the intelligence.